Discover the Cosmopolitan Hotel, Dubai, a contemporary and innovative hotel located in the heart of Al Barsha. 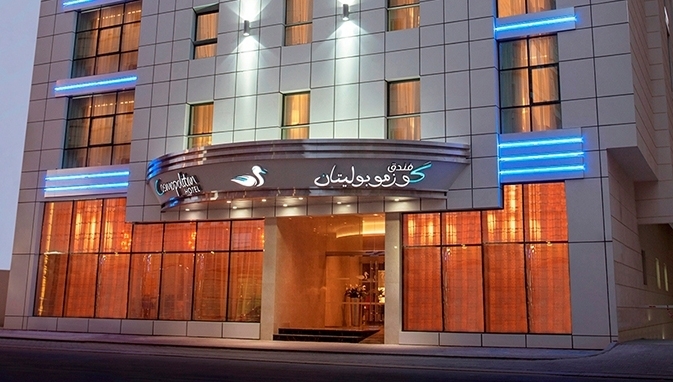 For those travelling to Dubai on holiday as a couple or a family, or for those who are here on business, the Cosmopolitan Hotel’s convenient central location and 4 star rooms and suites provide the ideal base for any stay in the city. Located next to Sheik Zayed Road, our hotel is adjacent to Internet City, Media City and Knowledge Village. For those who wish to indulge themselves with a spot of shopping, one of Dubai’s most famous malls, Mall of the Emirates, is only 5 minutes away from the hotel. For effortless arrivals and departures, Dubai’s two international airports are within easy reach: Dubai International Airport and the new Al Maktoum International Airport are just 30 minutes away. Our business-oriented guests can enjoy easy access to the nearby Jebel Ali Free Zone as well as The Dubai Exhibition and Convention Centre. Guests have walking access to public transportation at the Sharaf DG metro station (Nr. 33) to take a ride with the driverless and state-of-the-art metro. To download the Dubai Cosmopolitan Hotel location description, please click here.